You all know that I can't seem to say enough lately about my new iPhone. I honestly can't remember what life was like without it or how I got along. This phone is absolutely amazing!!! I was even more thrilled when I found out that my go-to store for paint, Sherwin Williams, has an App too!!! 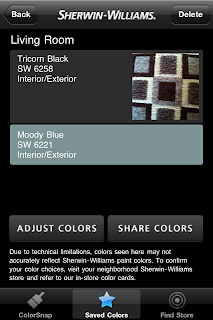 With the new Sherwin Williams Colorsnap App, you can use your smart phone to match real-world colors with paint colors. Get coordinating colors or create custom palettes. Search, browse, adjust, save and even share colors. All for free!! •Use your iPhone, Blackberry, or Android smart phone to capture a color that inspires you and match it to one of 1,500 Sherwin-Williams paint colors. •Create a custom palette or Ask Sherwin-Williams for colors that complement your color. 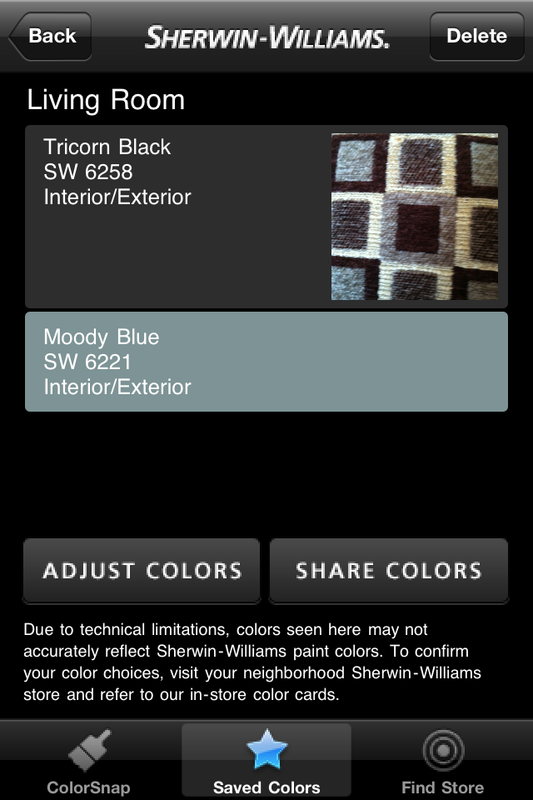 •Search for specific colors or browse the full Sherwin-Williams color palette right from your iPhone or Blackberry, or Android smart phone. •Fine tune colors using lightness, saturation and hue features. •Save colors to your "My Saved Colors" library to compare palettes or share via Facebook and email. •Learn detailed color information, including color names, RGB values, and LRV numbers—all with the ColorSnap app. With all of this information and convenience at my fingertips, I thought I would try it out in a real world situation. I am currently on a mission to repaint our Dining Room a blue-gray color to match the drapes and pillows currently in our Living room. Since our Dining Room is open to our Living Room, I would like for the two rooms to coordinate. 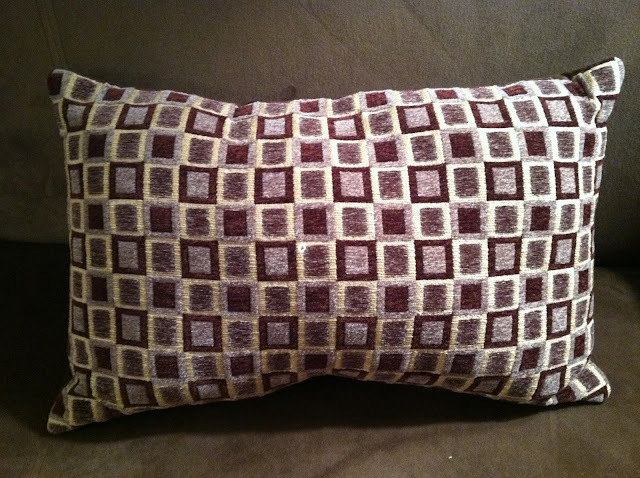 I decided to use the box print square pillows from the Living Room couch as my guinea pig. I was curious to see exactly what paint color this App would suggest for me. I had a few paint colors already in mind after looking through a few of the Sherwin Williams paint chips I had already owned. I snapped a picture of pillow and it instantly registered in the App. With your finger, you can move the cursor around to pinpoint the exact color on your picture that you want the App to match. I moved the cursor around to the middle of one of the blue squares. I hit the 'View Color Details and Save' button and out popped SW Moody Blue!!! As soon as I read the name of the paint color, it instantly rang a bell with me. I knew I already owned that paint chip in my collection. Two of the top paint colors that I was already considering were SW Rain and SW Interesting Aqua. Two colors only a few shades lighter on the SAME paint chip as SW Moody Blue! Well, I was completely sold!! I can't wait to see what other paint projects this amazing App will help me with!! Oh awesome!! I haven't heard of this app before! I'm off to go download it right now!! Thanks for sharing! that's awesome! I'm going to have to download that app as well. 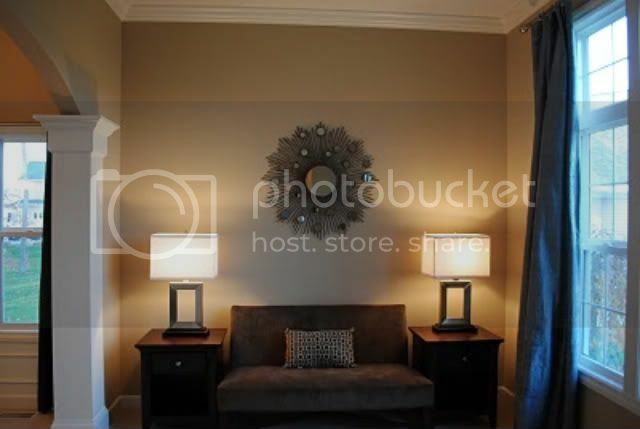 I cant wait to see how the room turns out! I've heard of this app but I haven't used it yet. The iPhone is greatness! I've heard about this app but never tried it! What a great idea! Thanks for sharing! New follower...great blog...congrats on being a host...stop by and link up to my hop if you like.. I love it! I need to download that app. I'm a new follower from Relax & Surf. I'd love for you to stop by my blog and follow back. Such a super fun app!! Love your blog. New follower from RELAX & SURF SUNDAY. blog hopping - congrats on being featured blog! Neat app - I too love my phone! Amazing I could function without it! I will be painting this fall can hardy wait to use the app! Thanks! Have a Fun Sunday! Congratulations on being the featured blog over at Sibley Smiles! :) I am a new follower and really enjoy your blog so far. I have this app and love it, it is wonderful and saves a lot of added bulk of carrying around the old swatch pads. Hope you are having a great weekend. I'm going to have to try this app, looks awesome! Following you via sit and relax blog hop.